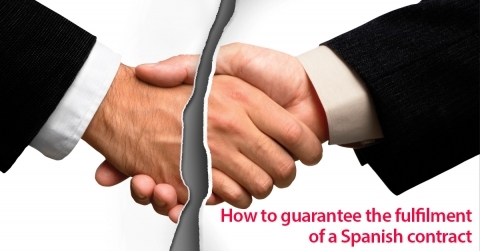 How to guarantee the fulfilment of a Spanish contract without additional expenses? The bond or the personal guarantee. In many cases, parties are concerned and are unable to enter into agreements because they are afraid that the other party may not comply with the agreement which could result in negative consequences such as non-payment, need to go to court to collect what is due or to recover possession of a property. For example, it is common for property owners who wish to obtain income from their real estate properties by renting them, do not do so, as they fear that the tenant may destroy the property or not pay rent. Readers should know that there are some mechanisms to ensure that a contract is fulfilled, or if it is not complied with, that they will be compensated for the damages caused. Security deposit, escrow, bond, bail: one alternative to ensure compliance or compensation in case of non-compliance of a contract is to request the other party to pay some money on amount as a bond or guarantee deposit, which is legally allowed in some cases, like on the urban letting regulation. The problem is that sometimes the amount of the deposits established by law is not enough, or the other party cannot afford to pay in advance large amounts of money at the beginning of the contract, so this guarantee may be insufficient. Bank guarantee: there is also the possibility of requesting that the other party to arrange a bank guarantee for the amount of money required. This is a good option, but there would be some bank charges to be paid, and also the money will be blocked in a bank account. Bond or personal guarantee: one of the most economical and interesting options to ensure payment of a possible debt and the fulfilment of a contract, is a personal bond or guarantee, because through it, the landlord can request a third party (with recognized solvency) to sign as a guarantor, that is to say that the guarantor guarantees that in case one of the parties does not fulfil the contract, he/she will do it on his/her behalf or compensate for it. This type of personal guarantee is very common in the leasing of properties to young people or students, because they normally do not have a job or income, and their parents are asked to act as personal guarantors, responding to the fulfillment of the contract. For the party giving this guarantee, the advantages are obvious: they are usually free of charge (because parents, siblings, etc. are the guarantors) and also there is no need to block the money, or pay any extra amount at the beginning of the contract. In this type of personal guarantees agreements, regulated in articles 1822 et seq. of the Spanish Civil Code, it is essential that they are drafted correctly, so that the guarantee is sufficient, it being advisable that the guarantor be jointly and severally bound with the debtor, to renounce to certain rights (division, etc.) and to extend the guarantee to the contract and to the possible annexes, extensions, etc. which can be agreed upon. If you are in this situation, or if you have legal query please, contact us and we will help you.